The following untitled poem was found in Steve's bedroom the day after he died. Trying to avoid the bees. Hoping for the absence of hope. Searching for what might never be found. The poems below were written by Steve in his Sophomore year of high school. Then all would be equal. Then the world would destroy itself. Then they would mature into lizard-like creatures. then they would rebel and take over da world. Then I would live happily for the rest of my life. 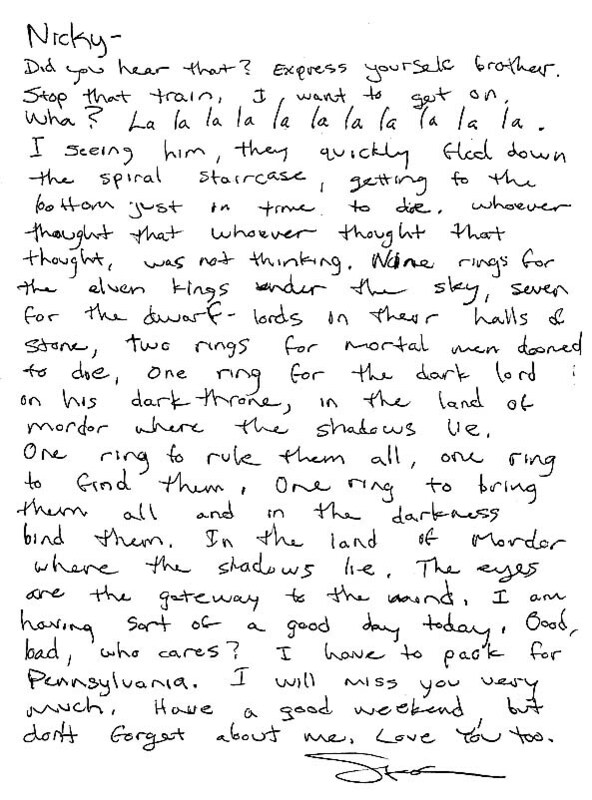 Below is a note to Nicky P. referencing Tolkien. Click to enlarge the image. Who is better. Who is incorrect. Are these the battles of our time? The Battle is about to begin. Is now the end of time?